Mario Lucia has the famous dad, the scholarship offers coming from all corners of the country and a passport that indicates he is something of a world traveler. 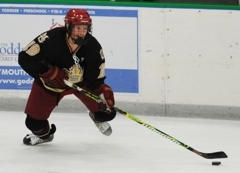 Tony Cameranesi has an Upper Midwest High School Elite Hockey League scoring title and a commitment to play at Minnesota-Duluth. And then there’s Tyler Klein. 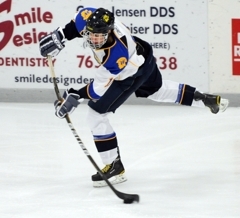 While Klein might not have the resume to match his high-scoring Wayzata linemates, the 6-foot-3 senior does have a knack for getting his big frame into scoring position. And by scoring position, we mean all but inside opposing goaltenders' chest protectors. It was Klein who, while stationed in front of the net (where else? ), deflected a third-period point shot from defenseman D.J. 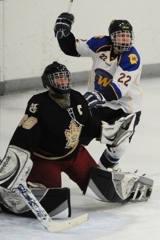 Jones into the goal, allowing Wayzata to escape with a 3-2 triumph over Maple Grove in the season opener for both teams on Friday, Nov. 26, at Plymouth Ice Center. 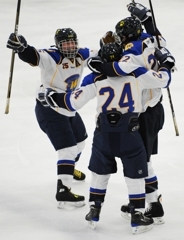 Wayzata meets defending state Class 2A champion Edina in the championship game of the Trojans’ annual Turkey Trot tournament on Saturday at 7:30 p.m. Edina beat Buffalo 6-1 in Friday’s other semifinal. Klein’s goal, which came 5 minutes, 2 seconds into the third period, broke a 2-2 tie. It was the only goal scored by a member of the Trojans’ top trio, a line that sits on everyone’s short list of the best in the state. “It wasn’t as good as it was in the past,” Lucia said about the chemistry of the line that combined to score 119 points last season. “But it was the first game of the season, we’ve only had a couple of practices together. 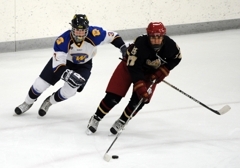 Part of the line’s problems also can be pinpointed to a Maple Grove defenseman named Steve Popowitz, whose shot blocking and heavy hitting exacted a toll on Wayzata’s marquee trio. Popowitz (Poppy for short) and defensive partner Drew Aspinwall were matched against the Lucia-Cameranesi-Klein unit all game. Lucia -- whose father is Don Lucia, the University of Minnesota’s men’s hockey coach -- spent much of the fall playing for the U.S. National Development Program’s U-17 team. He finished his stint as an injury replacement three weeks ago with a tournament in Europe. 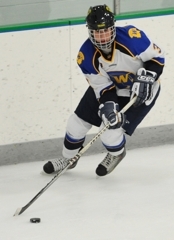 With standout junior defenseman Miles Death out of the lineup with a broken ring finger, that meant more ice time for Wayzata senior D.J. Jones in the Trojans’ Friday, Nov. 26, season opener against Maple Grove. 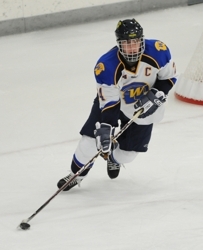 With Wayzata’s top line of Tony Cameranesi, Mario Lucia and Tyler Klein searching for the magic that made the trio so dangerous last season, that meant more offensive pressure on the slick-skating senior defenseman. In the end, the extra workload for Jones meant a potent source of offense -- and a victory -- for the Trojans. Jones ripped a cannon from the point for one power play goal and set up another when his low shot was deflected by Klein for the eventual game winner in the 3-2 triumph at Plymouth Ice Center. Wayzata went 2-for-4 on the power play. 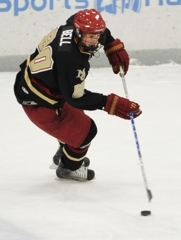 The 5-foot-9, 165-pound senior was whirlwind skating the puck out of his zone and was a big physical presence despite his undersized frame. He showed some offensive flair on the power play, racking up a goal and an assist thanks to cannon shots from the point. 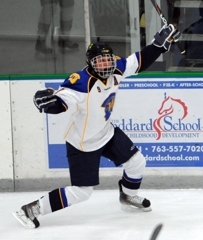 Popowitz and his defense partner, Drew Aspinwall, were assigned the task of containing Wayzata’s supercharged line of Mario Lucia, Tony Cameranesi and Tyler Klein. That line did not score during even-strength play and Popowitz, who at one point slammed Cameranesi into the boards with a booming hip check, was a big reason why. Popowitz also set up Dylan Steman’s power-play goal with a nifty head fake and pass that had the Trojans going the wrong direction. 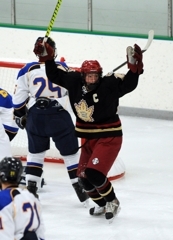 The towering (6-foot-2, 180-pound) senior forward scored the game-winning goal during a third-period power play on a well-executed deflection. He also added an assist. 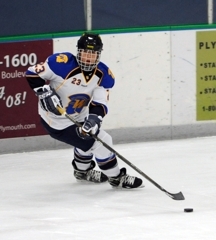 Tyler Klein scored the game-winner 5 minutes, 2 seconds into the third period on a power-play deflection and Wayzata held on to beat Maple Grove 3-2 on Friday, Nov. 26, at Plymouth Ice Center in the season opener for both teams. 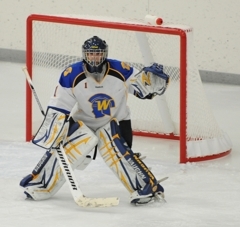 The game was a semifinal of Wayzata’s annual Turkey Trot Tournament. Edina beat Buffalo 6-1 in Friday’s other semifinal, setting up a 7:30 p.m. Saturday championship showdown between the Trojans and the Hornets at Plymouth Ice Center. Buffalo and Maple Grove will meet at 5 p.m. in the third-place game. 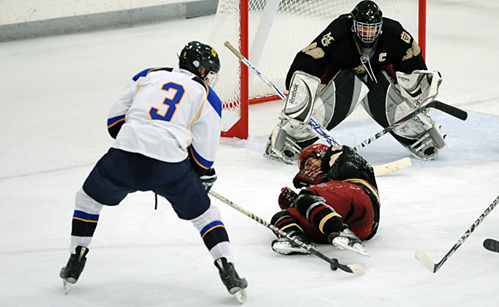 Bryan Tabery also scored for the Trojans, who got 23 saves from goaltender Andrew McIntyre. Tyler Dunagan and Dylan Steman scored for Maple Grove, which held leads of 1-0 and 2-1. 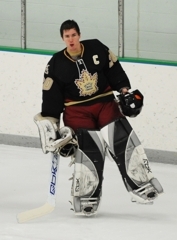 Senior goaltender Ryan Coyne made 23 saves for the Crimson.